I started off the year taking ballet class only about twice a week on average. In February, it was my two year anniversary since starting ballet. Early on in the year, I attempted a four month session of Intermediate class. Although at the time I wasn’t ready for it, by the time summer came about I was ready to try again (and this time I got through it!). Over the past year my dancing has improved so much. I also found another local dance studio that offered open drop-in adult ballet classes, and not only that, it was more affordable than the other studio I got to. By the later part of the year I was taking class on average four times a week, though sometimes even five or six. It’s been great. 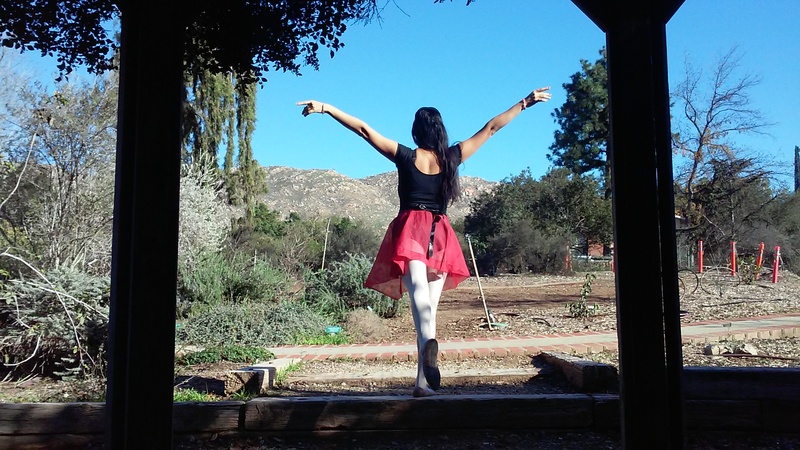 And that’s just ballet – this past year I also started modern dance classes, twice a week. I didn’t start until later on in the year, but I do think I will be continuing on with this. It was pretty cool using what I’ve learned in ballet (mostly balance, but also alignment and flexibility) to actually be somewhat decent at it (it was a beginner level class). I saw several live perfomances, including my first Swan Lake (by the Grand Russian Ballet). I’d been wanting to watch Swan Lake live for so long and I was definitely excited. It was great, but I’m still hoping to one day see it performed with a live orchestra. I also caught a couple other performances by smaller local companies, which were nice. Also saw a lot of modern dance performances through my school. Most of the time I don’t understand what it’s about, but when I do – those extremely rare times – it’s awesome. Then I got to be in a performance, which was just incredible. A LOT of work too, but a dream come true. It was so much fun to get to wear a tutu and dance onstage. I’d been wanting this ever since I first started ballet (though I never would have admitted it, because I felt I was being unrealistic), so it felt really good to actually meet one of my goals. Now that it’s happened, I feel a lot more calm about it. I don’t know yet if I will try again for another one, because sometimes I feel like I just want to remember how amazing this past experience was, and not ruin the memory by trying to recreate it. But, I may… I’m just not making myself any promises yet. If we do repeat the same ballet we did – unlikely, but a possibility – then I’m definitely gonna try out! I’ll train as if I was going to for sure either way. This past year early on I also started pilates, doing it pretty consistently which gave me great results in improving my dancing (specifically balancing and posture – which came from imcreased core strength) but mostly an overall increase in proprioception and the little subtleties of movement)). Seriously, it was the best thing I could have done for my dancing and for my body overall. My posture has never been better! Possibly equally important, I discovered body rolling on a foam roller (also through pilates class). I got myself a roller and now spend countless hours torturing myself with the zeal of a masochist slowly rolling out my tight muscles and fascia, which hurts so much that it feels good. My quads are especially tight, and ever since I’ve been slowly rolling them out I’ve gotten closer to the floor than ever in my front splits. On the not-so-fun side of things, I also had some minor incidents (I don’t think they qualify as injuries) this past year. I slipped and fell in the rain, and landed on my tailbone. It hurt for months (but I was able to continue ballet). Then, just weeks before my performance I landed wrong in a jump and hurt my hip and thigh. The recovery break afterwards did cost me some of my strength and stamina, but I’m recovering quickly. I’ve taken class a quite few times afterwards and I’m feeling stronger. What’s in store for next year? My goals? I would like to continue taking class as often as possible, at least 4 days a week, preferably 5. 1 year ago if I had read that I would have been like ‘yeah, dream on!’ but things have changed so much for the better that it is actually a possibility. Both the discovery of New Studio, and now being eligible for Intermediate at Adults Only Studio helped, but also the schedule at my regular school has improved. And what I’d be paying for about 5 classes per week for a whole month comes out to about what people in nearby areas are paying for just 5 classes – total. I feel so very lucky, to have these options available, which make it actualy possible for me to take class this often. So thankful. And just knowing that I have my barre at home helps me feel like there’s always time for a little ballet. Oh, and I also updated the Learning Curve page if anyone wants to check it out. Newer stuff is at the bottom. This entry was posted in Trip down memory lane, Uncategorized and tagged adult ballet beginners, Adult ballet students, ballet class, end of year, fun with ballet on December 30, 2015 by kit.